"Oh, bless our God, you peoples! And make the voice of His praise to be heard. 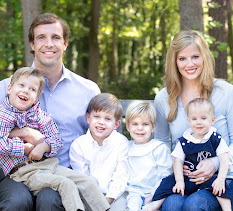 But You brought us out to rich fulfillment." Has life left you with any scars? I'm guessing if you're old enough to have lived through middle school, then you can answer "Yes" to this question. :) And if you are younger than middle school age or enjoyed playing outside during that season of your life, then I imagine you have some scars of which you are quite proud and stories that accompany them. But I think we all know that we also carry scars that weren't left from pleasant experiences, experiences we can't look back upon with a chuckle. Some of these scars are external and others are internal. Regardless, these scars leave us forever changed one way or another, and they hold their own stories that are etched into our hearts. John has a few of his own scars. In the past, I have looked at these scars with sadness... They have reminded me of all we have endured as a family and all John has had to experience at such a young age. Another tempting opportunity to ask, "Why?" He has multiple scars on his forehead (left and right sides) from EEG leads (the EEG is the procedure that analyzes the electrical activity in the brain). John during an EEG as a baby... the metal leads are attached all over his head under the gauze wrap. John also has two scars on his thighs, one from a skin biopsy and this one below from a muscle biopsy, both testing for mitochondrial disease before he even turned 1. Then there are the scars that dot his wrists, hands, arms, and feet from IVs and central lines from his first 3 months of life spent in various Intensive Care Units. I find scars are another one of those things that simply takes time and God's healing touch to be able to discern the beauty that eventually comes forth, the insight that is offered, the comfort that can be extended to others in similar situations, and the strength that is manifested in our weakness (2 Corinthians 12:9). Isn't it interesting, that even in His glorified state after the Resurrection, our Savior still carried and boldly revealed his scars? (See Luke 24:39) Furthermore, it is by His scars we recognize Jesus (and by His wounds we are healed, Isaiah 53:5). After telling the disciples to examine his hands and feet, He asserts, "You can see that it's really me." 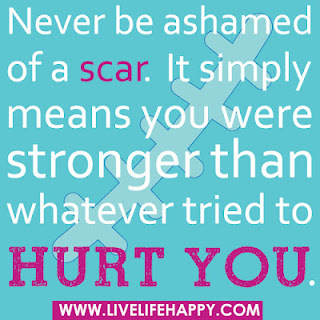 Wow, to think our scars are part of what makes us who we really are. Our scars and their stories. The shaping pain. The battles won. The future in store. Check out this post on scars from Katherine Wolf if you have time. The Wolf's blog is a true gift! Love this. 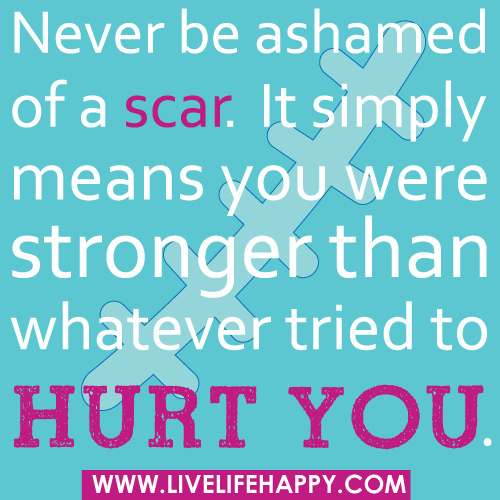 You're right that some scars are more visible than others. But, all can serve the great purpose of reminding us of our good God who is/was with us through the pain of those wounds and will refine us in their healing -- or already has.